You’ve all heard Indian powwow music, and you’ve all heard hip hop music. But simultaneously? Chris Sutherland of Toronto and Gitchie Cheechoo (a.k.a. Sylabix) of Moosonee are Ontario singer-musicians experimenting with such a musical fusion. The duo will perform Saturday at Carleton University as part of the second annual New Sun Symposium on aboriginal arts. This year the one-day symposium is entitled Aboriginal Arts and Healing: Reflections and New Directions. The lineup of musicians, visual artists, filmmakers and others for performances and discussions is designed to illustrate how aboriginal artists are combining ancient traditions with contemporary influences to produce exciting new cultural touchstones. In many cases, a desire for “healing” is rooted in the work of these artists, says Allan Ryan, the New Sun Chair in Aboriginal Art and Culture at Carleton and the chief organizer of the symposium. It’s a healing designed to allow aboriginal communities to have greater pride in their own culture and to show non-native society that aboriginal culture is not stuck in some distant, primeval past. Cheechoo is the lead singer of the White Tail Cree Powwow Singers of Moosonee in northern Ontario. He also is working with Sutherland, an urban hip hop singer, to create a fusion of the two genres. A CD is in the works. People attending the seminar will have a chance to hear this unusual experiment. “I feel that the connection between rap/hip hop and powwow can be an unstoppable force in communicating to native people both young and old,” says Cheechoo. 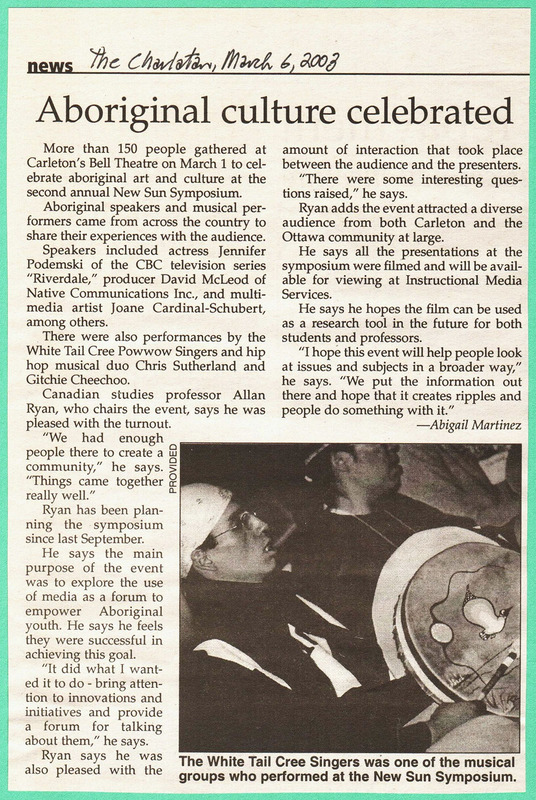 Other speakers at the symposium include: David McLeod, a writer and broadcaster from Winnipeg; Jennifer Podemski, an actress and film-maker from Big Soul Productions in Toronto; Greg Hill, a visual artist and curator who is helping the National Gallery of Canada to incorporate aboriginal art for the first time into its permanent exhibitions of historical Canadian art; Joane Cardinal-Schubert, a writer, curator and multi-media artist from Calgary; and Sheila Petzold, an Ottawa film-maker who co-produced Almost Home: A Sayisi Dene Journey. Petzold is the only non-native invited to the stage. Ryan believes that aboriginal art should not be “ghettoized” but he also believes that it should not just simply be absorbed into non-native art. Thus, he supports moves by the National Gallery and Art Gallery of Ontario to integrate aboriginal art into European-based Canadian art exhibitions. But he also supports the continuation of separate institutions like the Canadian Museum of Civilization to showcase aboriginal art specifically. 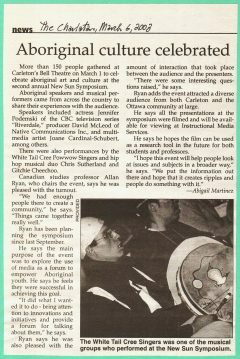 Aboriginal artists tend to identify themselves first as members of a particular First Nation or other aboriginal community while non-natives tend to think of themselves as individuals without any particular label, says Ryan. This means that aboriginal artists see themselves first as Cree or Mohawk or Algonquin and want to be identified as that, and not just as some more anonymous member of the Canadian family. The symposium is open to everyone and begins at 8:30 a.m. Saturday at Bell Canada Theatre, Minto Centre, Carleton University and continues until 5 p.m. Adult registration costs $20 and includes a buffalo stew lunch. For information, call 520-2600, extension 4035.